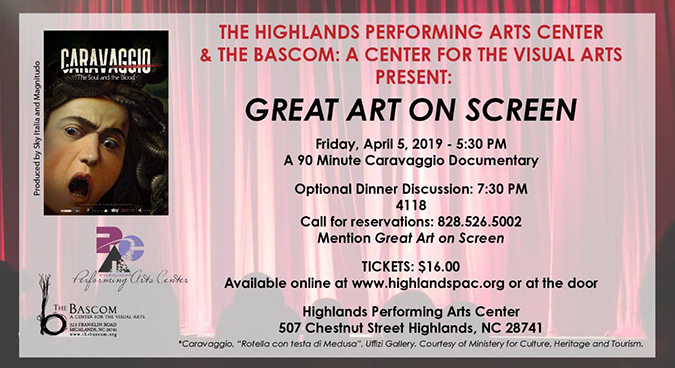 The Highlands Performing Arts Center (PAC) and The Bascom: A Center for the Visual Arts have joined forces to bring Great Art on Screen to the Highlands-Cashiers area. Great Art on Screen is a series of four 90 minute documentaries featuring some of the world’s greatest artists – Van Gogh, Caravaggio, Klimt & Schiele and Monet – which will be shown at the PAC in February, April, May and June. To bolster the atmosphere of community between like-minded art lovers, The PAC and The Bascom have invited guests to meet together after the show at restaurants around town for art based discussions. The second screening will be on Friday, April 5 at 5:30pm featuring Caravaggio. There will be an opportunity for discussion following the screening (around 7:30PM) at 4118 Kitchen + Bar, in the 64 Highlands (Bryson's) plaza. Call 4118, 828.526.5002, for personal reservations and mention Great Art on Screen. Tickets to the film are $16 and are available online at www.highlandspac.org or at the door – Highlands PAC, 507 Chestnut Street Highlands, NC.